The police forces of the UK tend to pick out pretty mundane vehicles. In towns the ‘panda’ cars tend to be dull-but-worthy, like the Hyundai i30, Vauxhall Astra and Ford Focus. Head out onto the motorway and you’ll find bigger cars like Volvo V70s, BMW 5 Series and the occasional Audi A4 Avant. But occasionally, as part of a trial or a PR stunt, police forces will bring out some oddities – although quite how practical or sensible they are is dubious. We’ve got ten of the strangest below. For a breakdown by make and model click here. 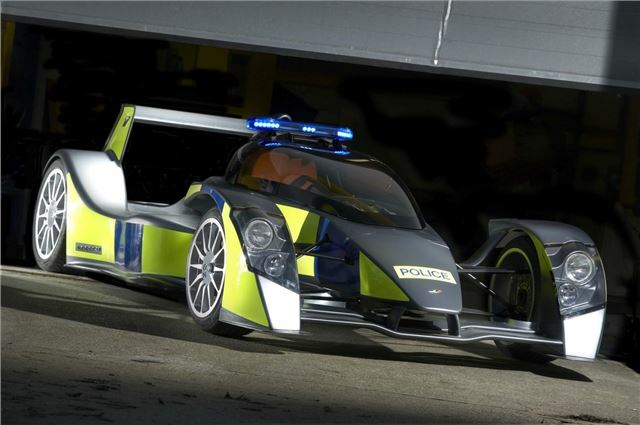 Caparo worked with the Metropolitan Police to produce the ‘RRV’ rapid response vehicle. Not many criminals would be able to outpace the T1 – it has active downforce systems like an F1 car and despite being a featherweight it has 575PS. Unfortunately – or fortunately if you think about the expense – it never made production as a police car, though a road car was available to private buyers.